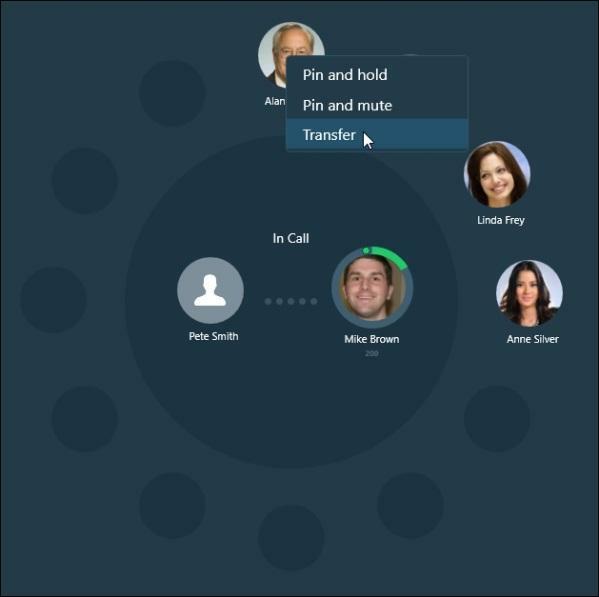 call.center™ is an innovative SIP-based softphone for Mac OS, iOS, Android, Windows devices and computers. It is specifically designed to securely and efficiently manage and control remote apps. 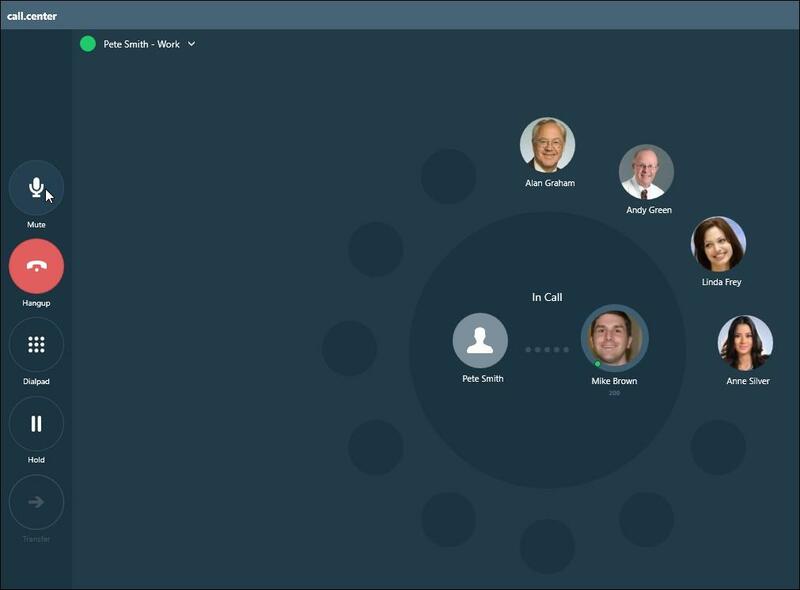 The call.center™ app presents a unique, simple-to-use, and intuitive drag-to-call user interface. 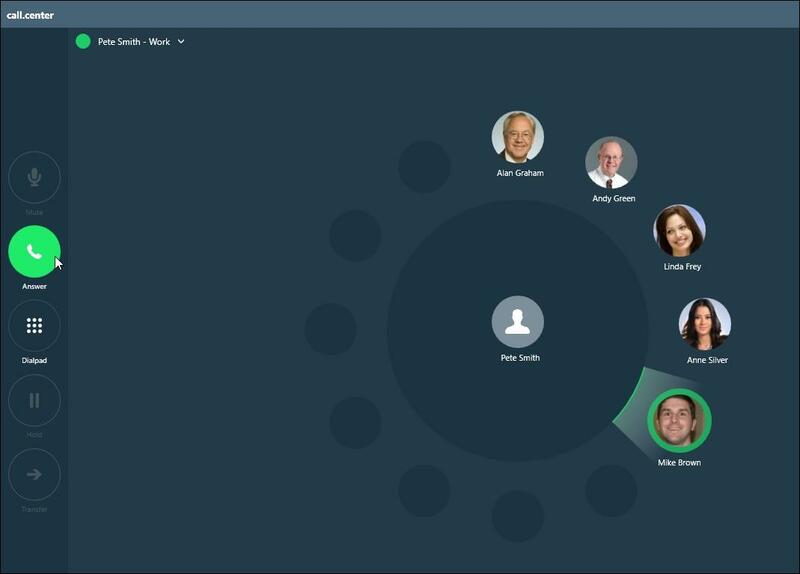 All its necessary functions are displayed front and center, smoothly integrating and optimizing voice operations with the workflow processes. 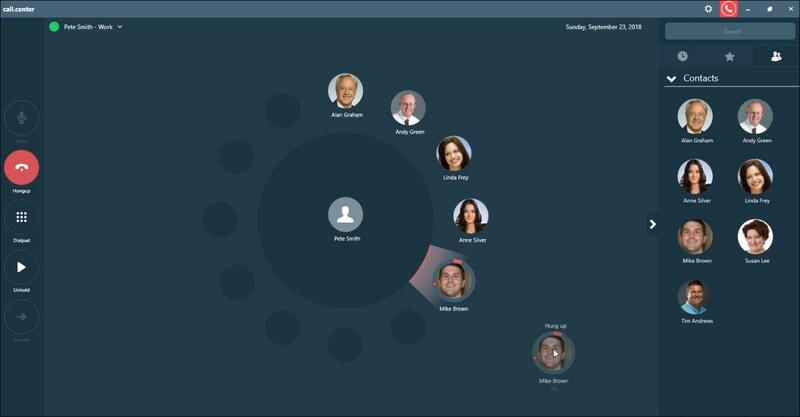 A fully-featured management portal is provided to use in conjunction with the call.center™ apps. This allows administrators to securely configure and maintain apps installed on user devices, regardless of their location or operating system. This means that SIP passwords are hidden from users, providing a significant layer of security for the underlying network. Multiple service providers may be included and multiple SIP accounts may be added to each provider. Multiple contacts, each with multiple end-user devices, may be included. In addition, each end-user device may be supported by a single or multiple SIP account(s). You can activate and deactivate devices via the management portal. You can use call.center™ with any SIP-compatible VoIP provider. call.center™ is integrated with phone.systems™, the cloud-based PBX platform from telecom.center™. call.center™ configuration and management depends whether you are using phone.systems™ or an alternative service provider. Both phone.systems™ and generic SIP providers may be used simultaneously by call.center™ apps. Free registration for the call.center™ management portal is available at https://my.call.center/. 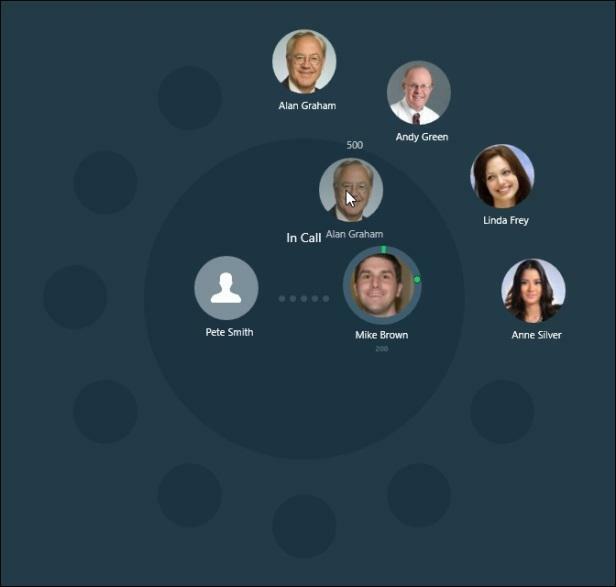 The call.center™ management portal is hosted on the telecom.center™ platform. 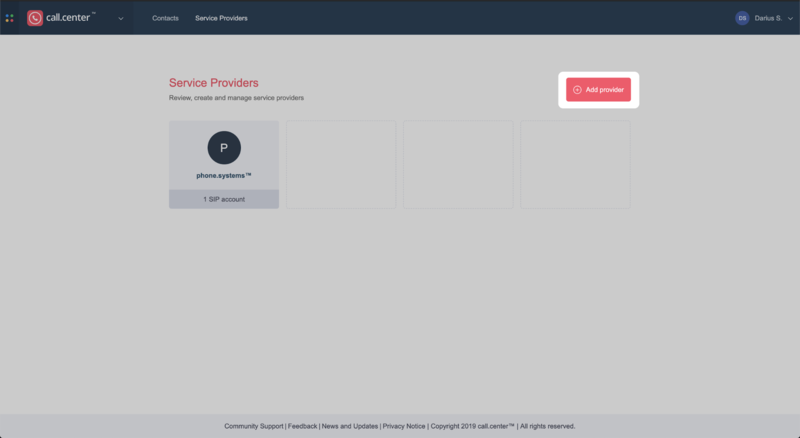 Registration on the telecom.center™ website provides a single sign-on access to a number of projects supporting open interconnectivity and standards, such as the cloud-based phone.systems™, PBX. Go to the https://my.call.center/ website. You will be redirected to https://my.telecom.center/ to log in. Click Next to display the following Register page. Check the Privacy Notice checkbox (required). Check the Subscribe to News and Updates checkbox (optional). Click the I’m not a robot checkbox to confirm that you are not a robot. A message is displayed informing you that an account activation link was sent to your email. Open your email which contains your activation link. To continue your registration, click the Confirm my account button. The telecom.center™ page is displayed and a message, saying your email was successfully confirmed, is displayed. Now, you can enter your email and password to access your account. To download the call.center™ softphone application visit the official call.center™ website at https://call.center/softphone-download/ and select your preferred operating system. Each platform has several download options that include links to the native app store as well as the direct download of the app installation files. The latest beta versions may also be listed available to download. Select the preferred download option. Once the download is complete, run the installation files and follow the setup wizard. The cloud-based PBX platform phone.systems™ is the call.center™ default service provider. Select the Service Providers section in the top menu. To add other SIP-compatible VoIP providers, click Add Provider. Add the service provider(s) by configuring the Basic Settings parameters. SIP Port (optional) - The port number carrying the SIP traffic. If no value is entered, the default port 5060 is used. For Advanced Settings, provide the SIP Proxy Address (optional). The service provider may require this parameter for outbound traffic. Click Save to complete the service provider configuration. Once a new service provider is added, click Add SIP account to add a SIP account to the service provider. Friendly Name – Enter a friendly name to reference the SIP account. - Toggle to Enter my SIP password manually on the Device or vice versa (when the toggle is green). By default, when the toggle is gray, the SIP passwords are automatically provisioned to the device during activation. However, when the option is enabled, the SIP passwords must be manually entered on the device. This option allows creating a device that does not store SIP-passwords on my.call.center panel. 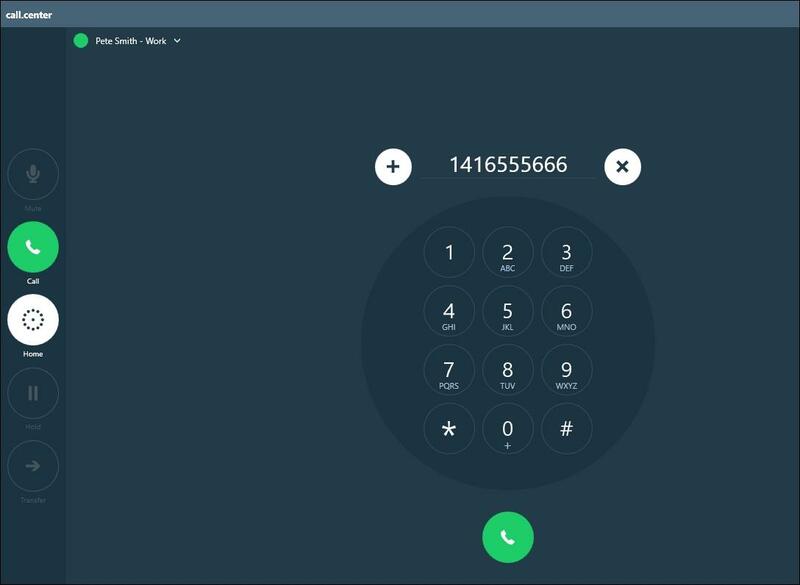 Instead, it inquires the user to manually input the SIP account in the classical manner directly on the call.center™ softphone client.The “auto” (grayed out) option is more secure as the actual SIP passwords are not stored on the call.center™ device locally. Furthermore, the “auto” option allows the administrator to “pre-configure” call.center™ devices, while the end-user just has to follow the “activation instructions” to set up call.center™ on the machine. SIP Username – Specify the SIP username provided by your service provider. Protocol - The underlying transport layer protocol responsible for SIP requests and responses. Select the UDP or TCP protocol option via the Protocol drop-down list. Important – If the SIP password has to be manually entered on the end-user device, the user is prompted to enter the enabled SIP account passwords on the device after activating the device. 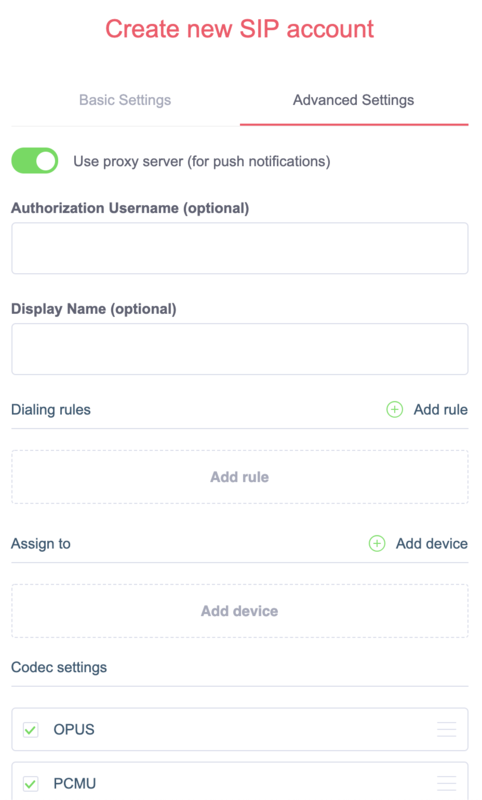 - Toggle to Use proxy server for push notifications (If disabled, push notifications will NOT be available). Push notifications, such as waking the device from the sleep mode for incoming calls, are required. This option must be enabled. Authorization Username (optional) - May be required by the service provider. Display Name (optional) – The name of the caller for the outbound call, this usually appears when making internal calls (between extensions) using the same SIP service provider. Dialing rules (optional) - Rules for modifying the phone number prefixes in outbound calls, see Making a call for further details. Click Save to complete the SIP account configuration. Additional SIP accounts may be added to this Service Provider by selecting Add SIP account. 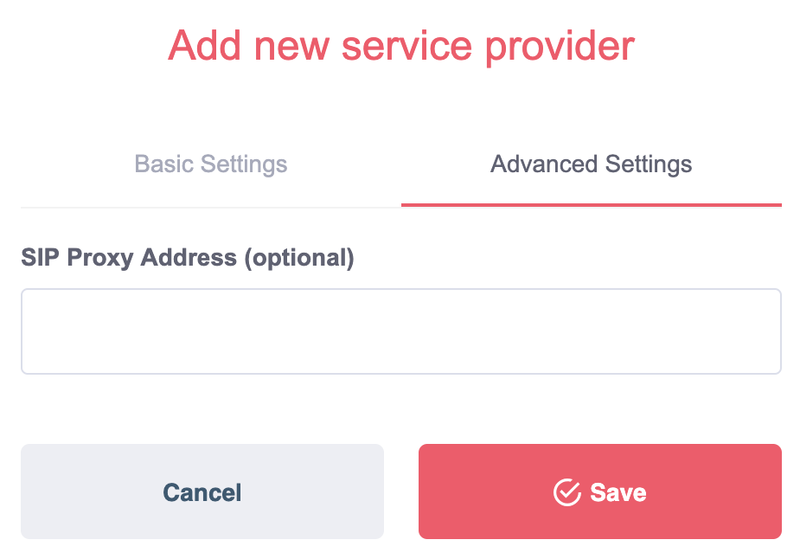 You can add, edit or delete SIP accounts from the Service Providers page by clicking anywhere on a Service Provider box except for the Edit icon. Contacts may be added, edited, or deleted on the Contacts page. 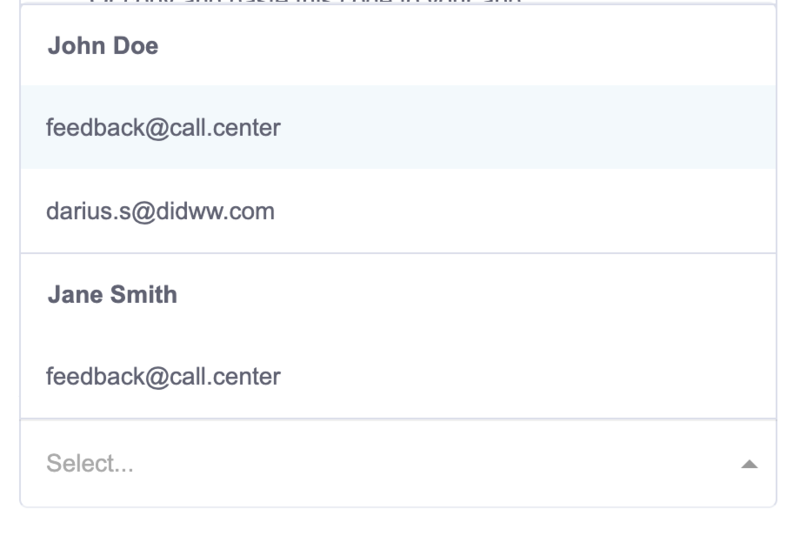 Note that single or multiple devices (call.center™ end-user apps) are allocated to each contact as described in the Architecture section. 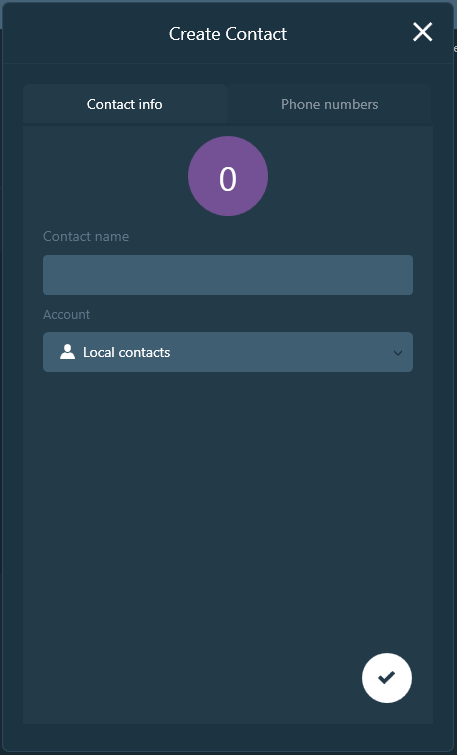 If no contacts have been added to the platform, then the Contacts page appears as shown below. However, if contacts have been previously added, then the contacts are listed, and the contact details may be edited by clicking at the top right corner of a Contact box. A new contact may be added by clicking on the Add contact button. Emails (required) - The email address(es) to which the app download and activation instructions should be sent. An email label is also required, with the "Work" or "Home" options available for selection from a drop-down menu. Multiple email addresses may be added by clicking on the Add new button. The configuration of the contact is completed by clicking on the Save button. Devices, or call.center™ end-user apps, are allocated to contacts, and each device is supported by a single or multiple SIP account(s). Once a new contact is created, devices may be added to that contact by clicking the Add device button. Device Name (required) - A friendly name for the device. SIP accounts (required) - The SIP account(s) used to support this device. 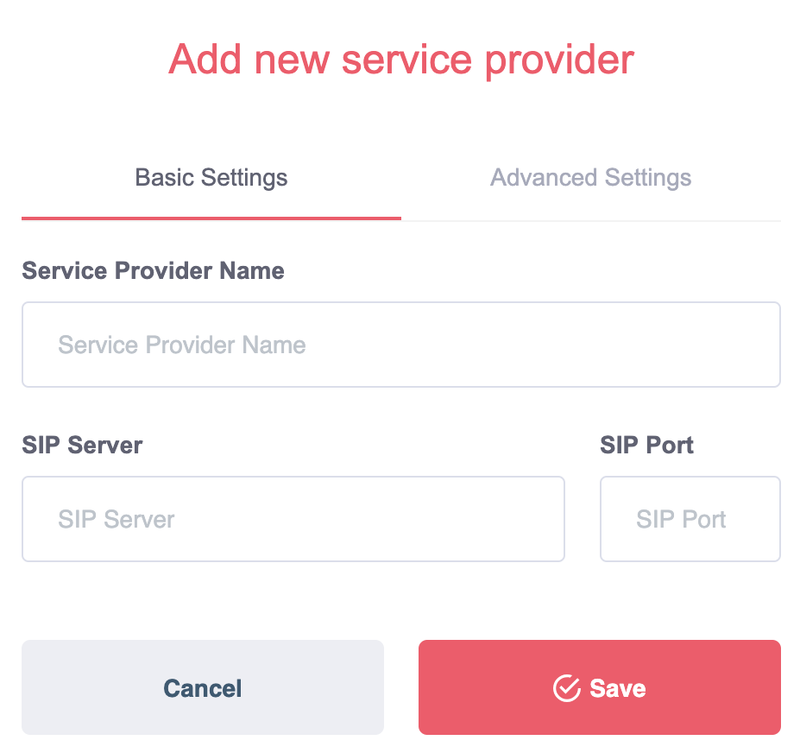 This parameter is selected from a drop-down menu that lists all of the SIP accounts previously configured for each service provider. Each device may use up to four separate SIP accounts. Use the Add account button to add SIP accounts. Delete a SIP account from a device by clicking the icon next to the account name. Click the Save button to complete the configuration of the device. Once the new device is configured and saved, the end-user app may be installed and activated with this device. See Activating the call.center™ app for further details. In general, devices may be added, edited or deleted from contacts by accessing the Contacts page, and then clicking on the relevant contact. All of the devices added to the selected contact are displayed. 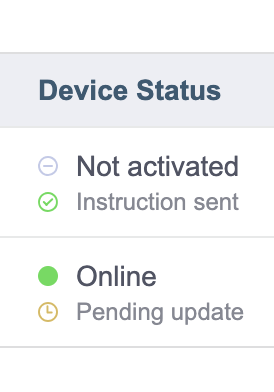 Device Status – The status of the device. Device status may also have a sub-status, which informs about pending actions for a specific device. Instructions sent - Device activation instructions were sent to the specified email, but the activation key inside has not been used yet to complete the activation. Pending update – The device was activated and configured earlier, but some configuration changes were made afterwards, and the device has not been updated yet with the new configuration. SIP Accounts - The SIP accounts that support the device. It also displays the status of the SIP accounts. Click to edit the device. Click to go to the Activation Instructions page. 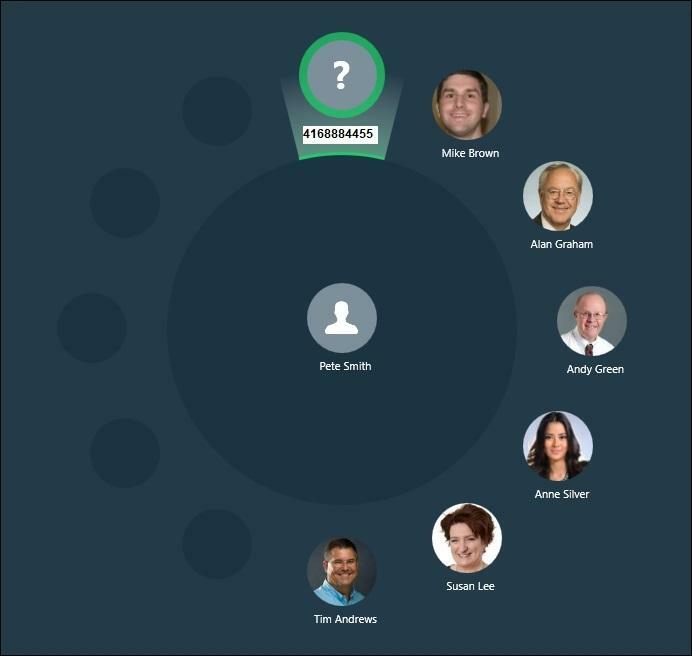 Once the service provider, contact and device were configured using the call.center™ management portal, the app on the end-user device may be installed and activated. Click the icon to open the device activation instructions. 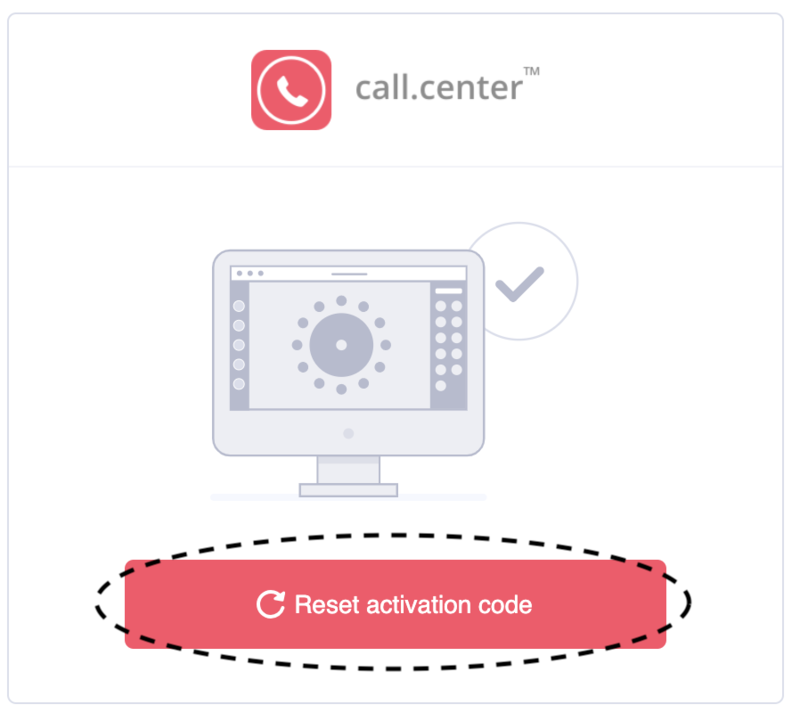 The activation depends on whether the call.center™ app has to be installed on the same device where the management portal is running, or on another (remote) device. 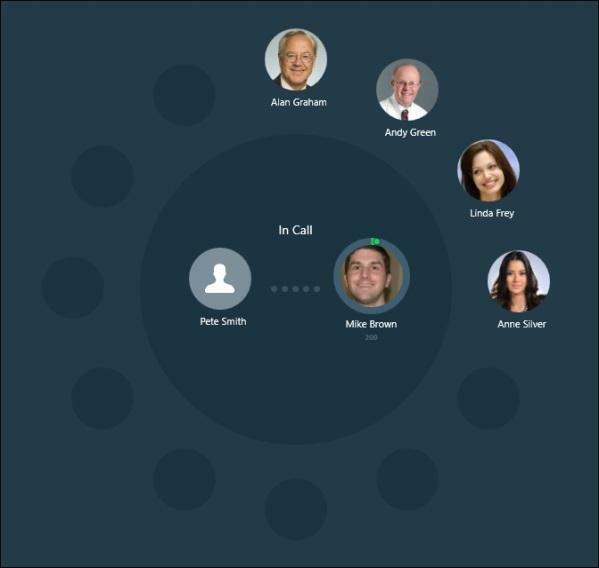 If the call.center™ app is installed on the same device where the management portal is running, it is recommended to use the Click to Activate option to activate the device. Click button that is available in the activation instructions. 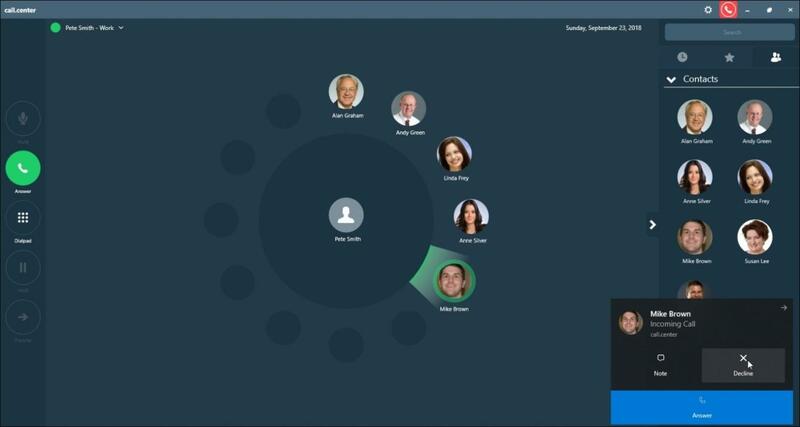 This action will launch the call.center™ application on the current device and complete the app activation automatically. 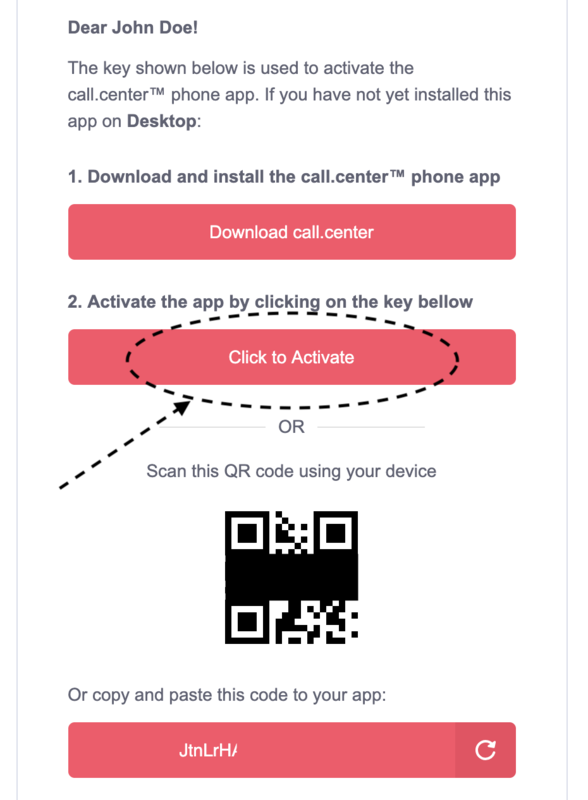 When the call.center™ app needs to be activated on a handheld device, but the received Activation instructions are displayed on another screen, it is recommended to use the QR Scanner option to complete the app activation. Press the icon to scan the QR code that was received. When other available activation options cannot be used, the activation code may be manually entered to activate the call.center™ app. Enter the activation code included in the activation instructions email or the management portal. 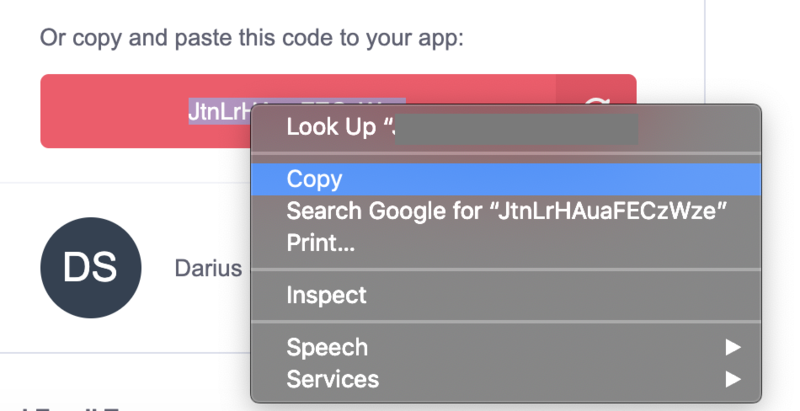 This activation code may be simply copied from Activation Instructions, and pasted to the app. Click to complete the activation. 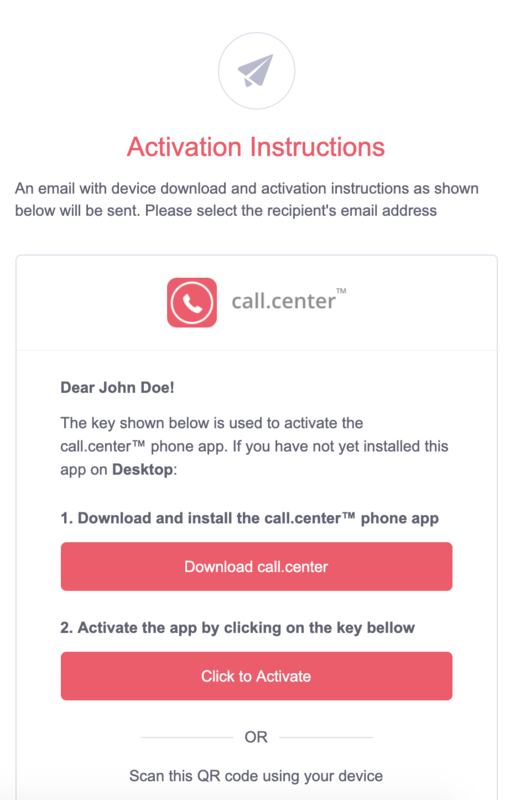 If the call.center™ app was installed on another (remote) device, the activation code as well as all the displayed instructions can be sent to a Contact’s email address. Click the icon to display the device Activation Instructions. Important – The dropdown to select the recipient of the email will contain email addresses that are added to Contacts. The recipient of the Activation Instructions email may use all available device activation options. After the instructions are sent, the related device receives “Instructions sent” sub-status and the activation code is then hidden from the Activation Instructions page to prevent unintended use of the code. Click the button. The sent activation code will be replaced with a new one that can be resent again. Important – Resetting the activation code for an already activated device will deactivate it. The Home screen consists of different areas, windows and menus. The appearance, layout and functionality of the main (or Home) screen is dependent on the operating system and device used. However, the information provided below is general to call.center™ apps. 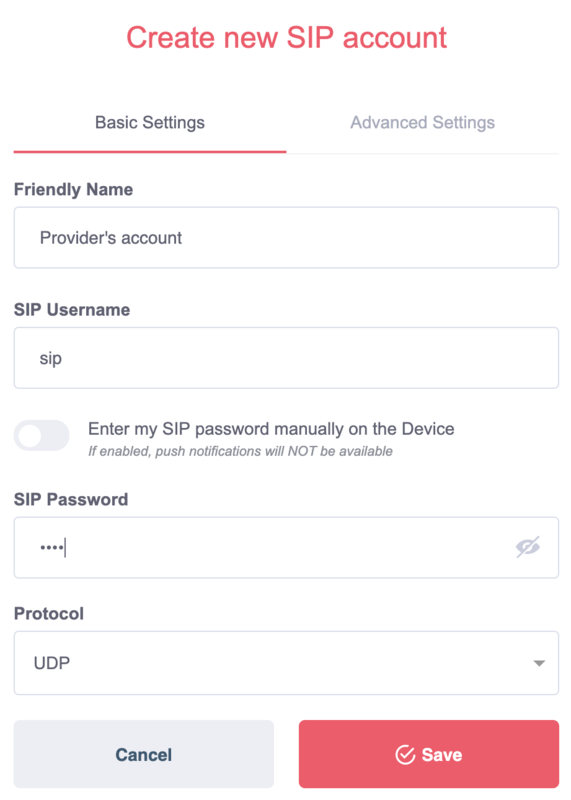 This information is located on the top left corner of the screen and displays the SIP account name as well as the current status of the SIP connection (Not Connected, Connecting or Connected). Note that if multiple SIP accounts are configured for this app, then the name of the account currently in use is displayed. This area serves as the main "workspace" for the call.center™ app, and indicates the current call status of the softphone. 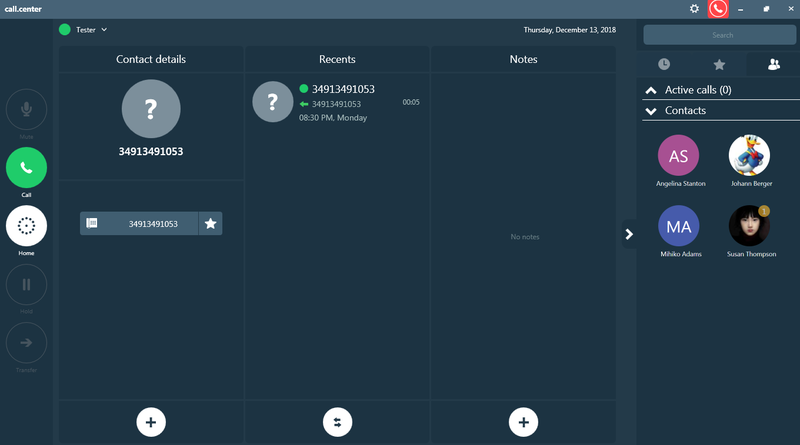 The central "contact" displayed is of the person to whom this app is registered, and clicking on this contact provides access to the app configuration, as well as call history and notes relevant to the owner of this app. / Mute/un-mute the microphone during a call (Windows, Mac OS, iOS, Android). That were "dragged" by the user from the Contacts, Favorites and Call History areas into the Favorite and Recents circle. 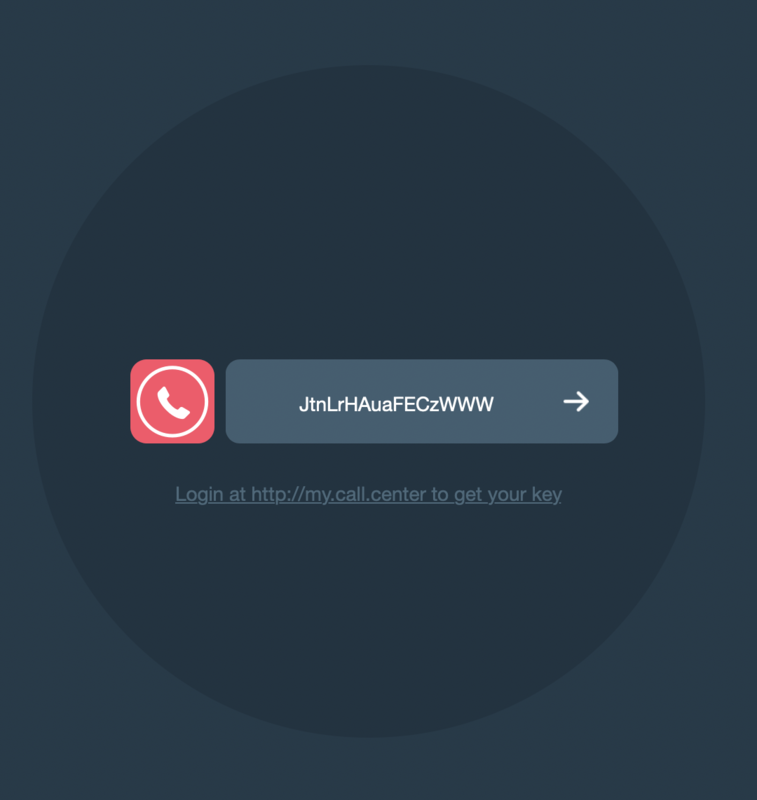 A ring from the call.center™ app indicates an incoming call. The caller’s icon appears by the area around the Home Circle. The caller’s icon and the Answer button are both highlighted in green indicating a ready state. See an example of an incoming call from Mike Brown below. Click the Answer button in the Phone Function Menu. 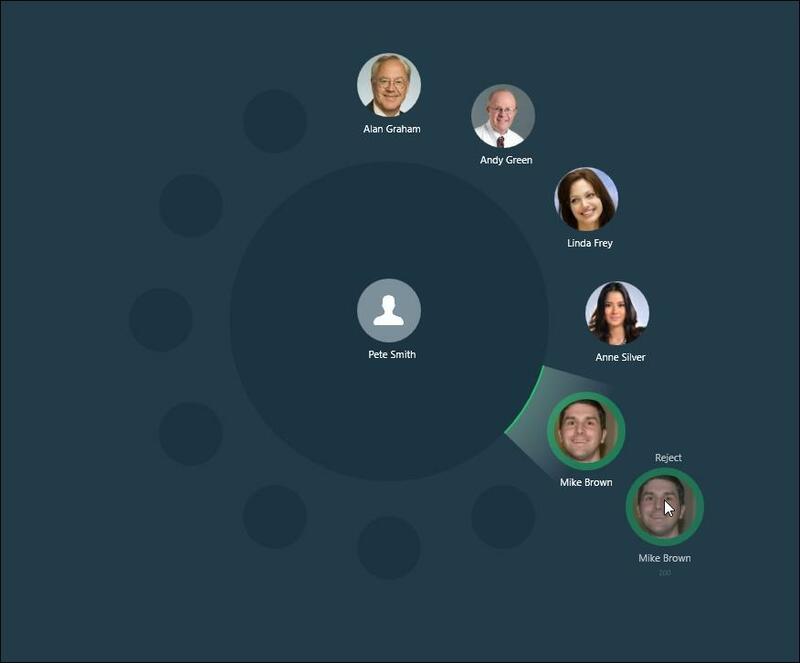 Drag and drop the highlighted contact associated with the incoming call into the Home Circle. Select from the incoming call pop-up notification, if enabled. 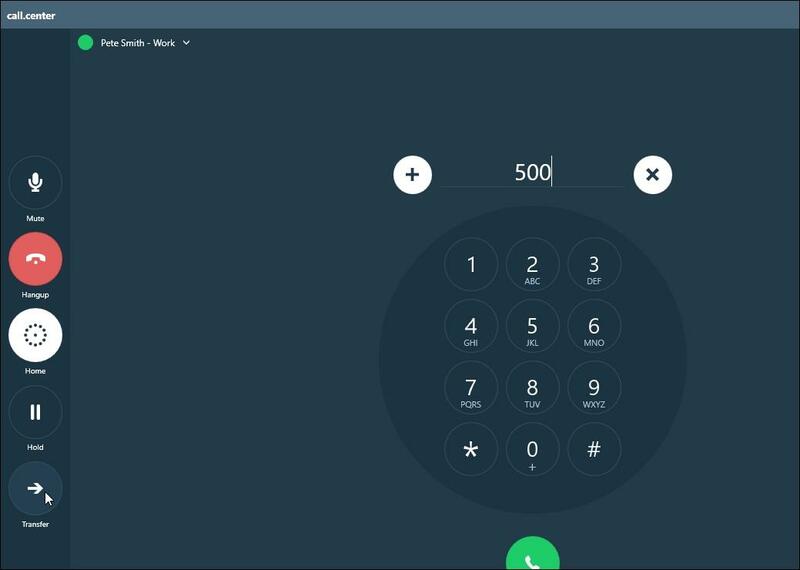 Once the call is answered, the caller’s icon joins the app owner in the Home Circle and the Answer button turns into a Hang-up button indicating that the call is in progress. 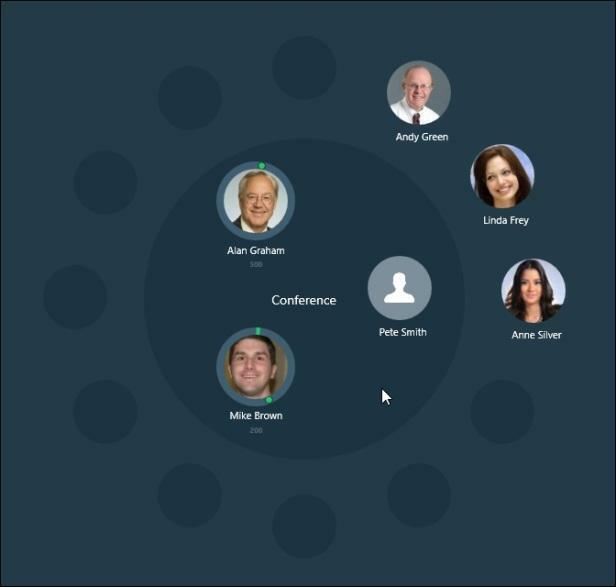 Drag the contact’s icon from the Favorites and Recents area and drop it into the Home Circle. 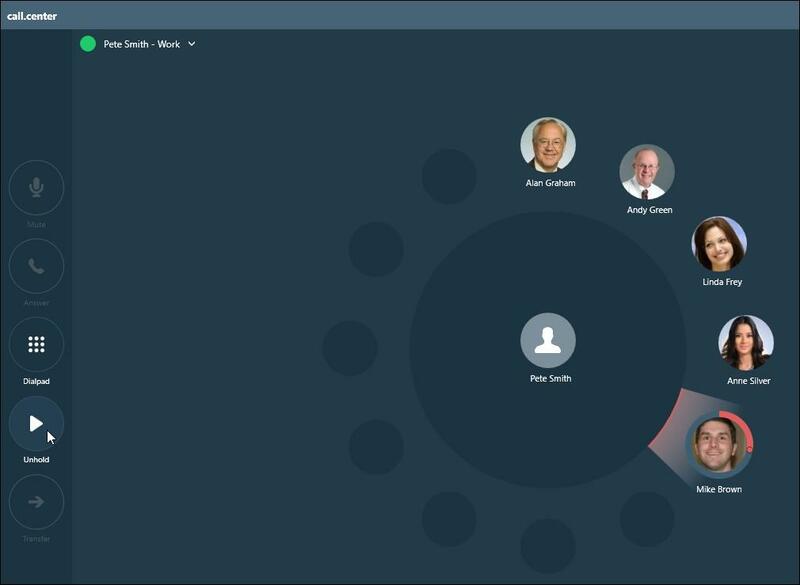 Drag and drop a contact from the Contacts area into the Home Circle. Select the Dialpad button from the Phone Function Menu to display the Dial screen. Go to the Contacts area and click the contact you want to call. The Contact details screen is displayed. The screen shows the list of phone numbers configured for the selected contact. Click on the phone number to use for the outgoing call. Manually enter the contact’s phone number and click the Call button below the dial pad or in the Phone Function Menu. Any incoming call from a known or unknown caller is displayed on the Favorites and Recents area surrounding the Home Circle. 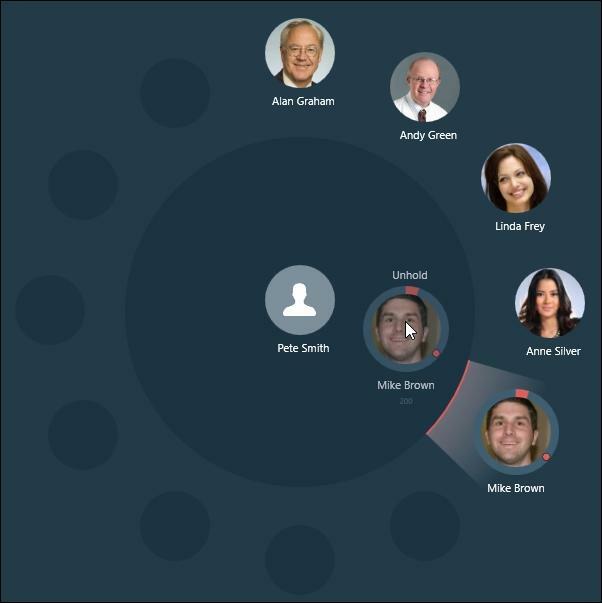 The caller’s icon is highlighted, as shown in the image below, where the incoming caller is Mike Brown. Drag the caller’s icon away from the Favorites and Recents area and then release the icon. Select the from the incoming call’s pop-up notification, if enabled. The in the Phone Function Menu is active when a call is in progress. When you place a call “on hold”, a pre-recorded audio file is played for the party that is "on hold". The call status changes to Unhold when you click the Hold button or when the call is terminated. 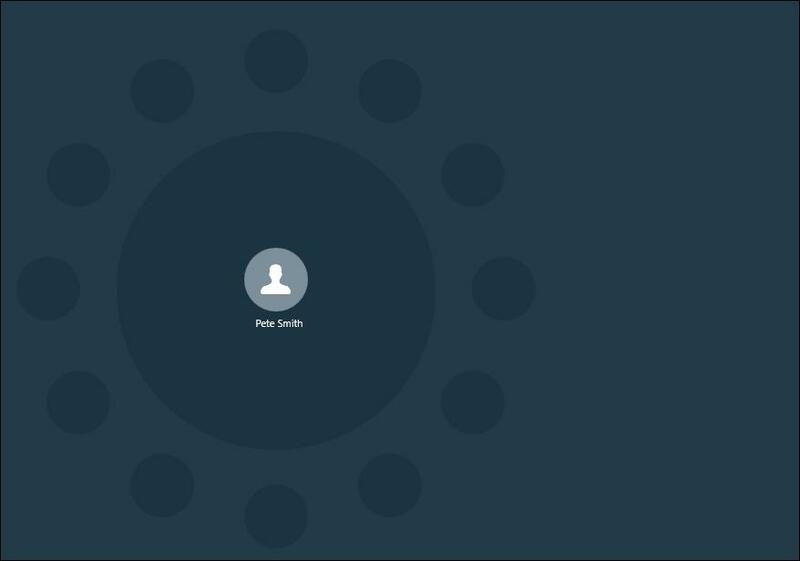 Once a call is "on hold", the icon for the "on hold" party moves from the Home Circle to the Favorites and Recents area to indicate the change in status for that call. When the Unhold button in the Phone Function Menu is active, you may use it to return the call to "Unhold" mode. Alternatively, you may drag and drop the "on hold" party’s icon from the Favorites and Recents area into the Home Circle for the call to return to normal mode. Terminate an "on hold" call without returning to the "unhold" status by dragging and releasing the "on hold" party’s icon into the corner of the screen. The Mute button in the Phone Function Menu becomes active once a call is in progress; click the button to mute the call. When a call is "muted", the muted party’s icon moves from the Home Circle to the Favorites and Recents area to indicate the call’s change in status. When the Unmute button in the Phone Function Menu is active, you may click it to return the call to normal status. Alternatively, you may drag the "muted" party’s icon from the Favorites and Recents area and drop it into the Home Circle to return the call to normal status. Terminate a "muted" call without returning to "unmute" status by dragging and dropping the "muted" party’s icon into the corner of the screen. First, an outgoing call has to be initiated as detailed in the Making a call section. 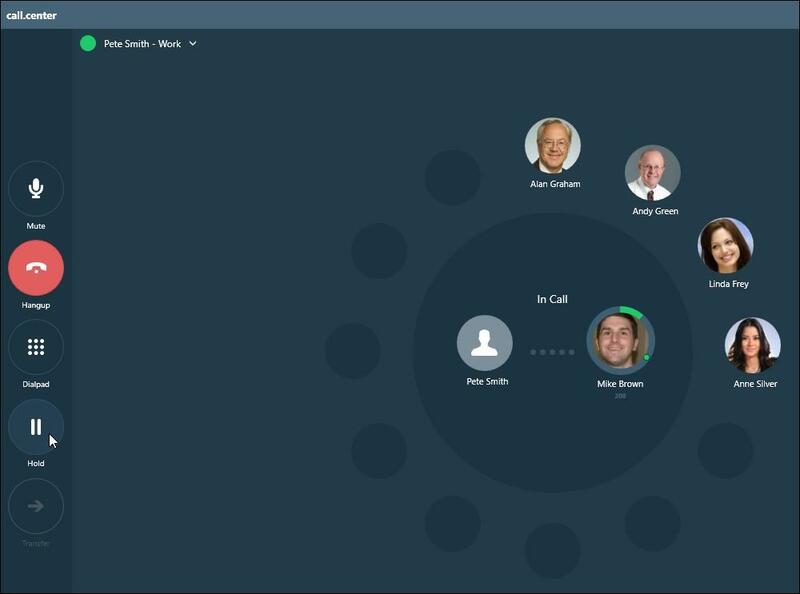 Once a call is active, participants may invite other parties to join a call or a conference call. 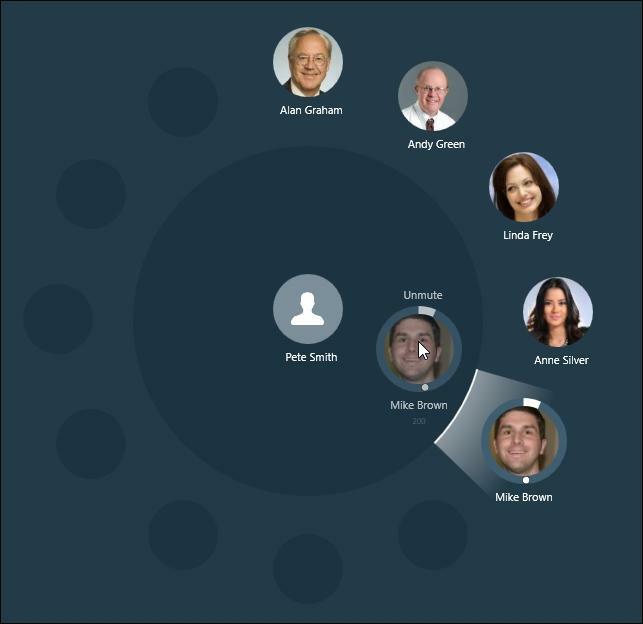 For example, Pete Smith and Mike Brown are in an active call as seen in the image below. 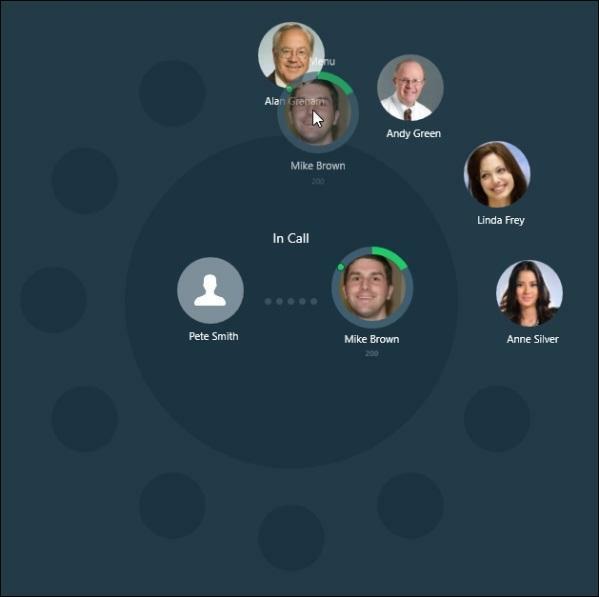 To invite another party, i.e., Alan Graham, to participate into the conference call, drag the relevant contact’s icon from the Favorites and Recents area and drop it into the Home Circle. Alan Graham's phone rings, if answered, Alan Graham automatically joins the conference call. 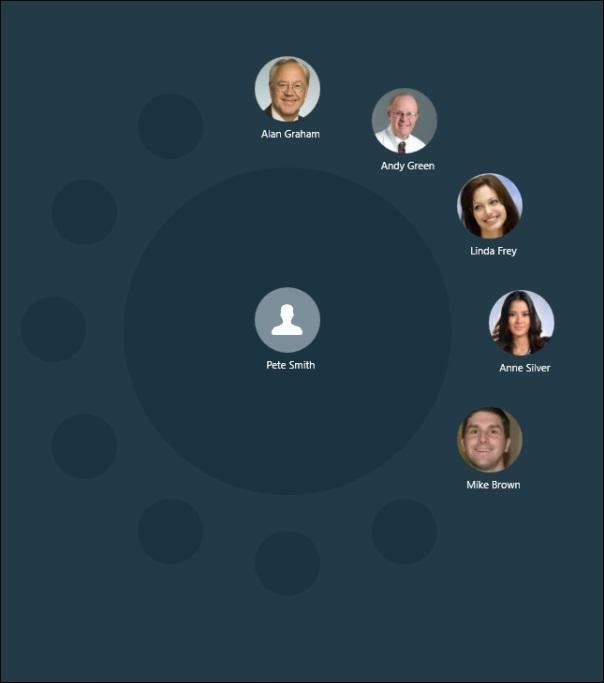 Note that the icon of the new participant joining the conference call, i.e., Alan Graham, now appears in the Home Circle of the call.center™ app belonging to the person who invited the new participant. 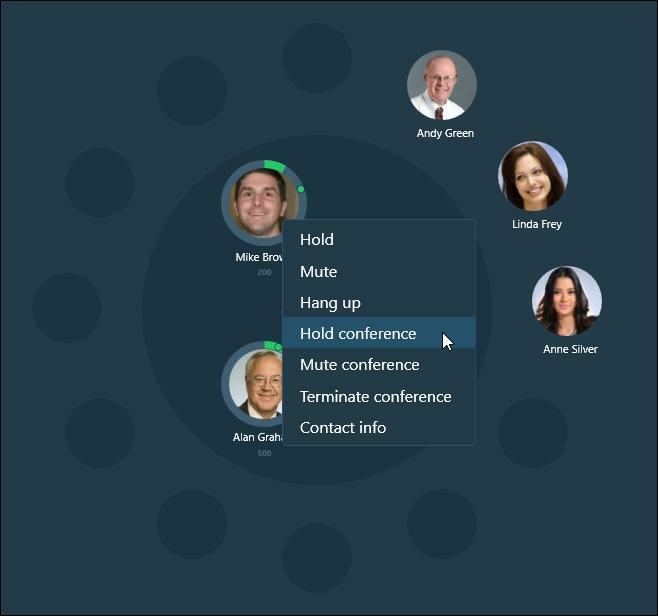 This means the inviting party fully controls the activities and participation of any invited third parties, and can Hold, Mute, or Hang up any conference call participants, or Hold, Mute or Terminate the conference call depending on the operating platform. Once a call is active, participants may transfer the call to other contacts. 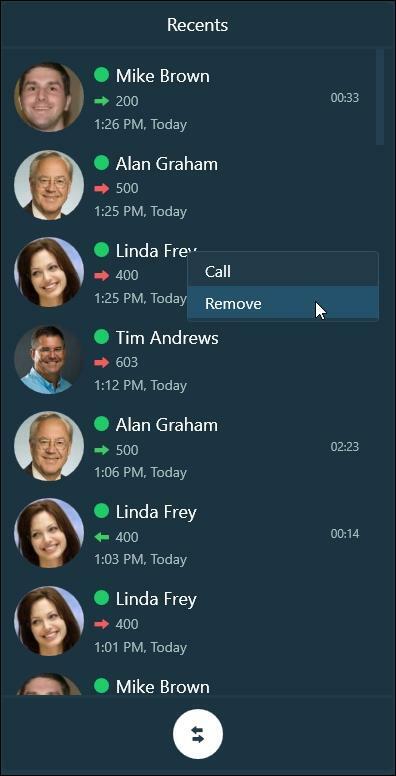 This is achieved by dragging the call participant’s icon from the Home Circle, and dropping the icon onto another contact in the Favorites and Recents or Contacts area. 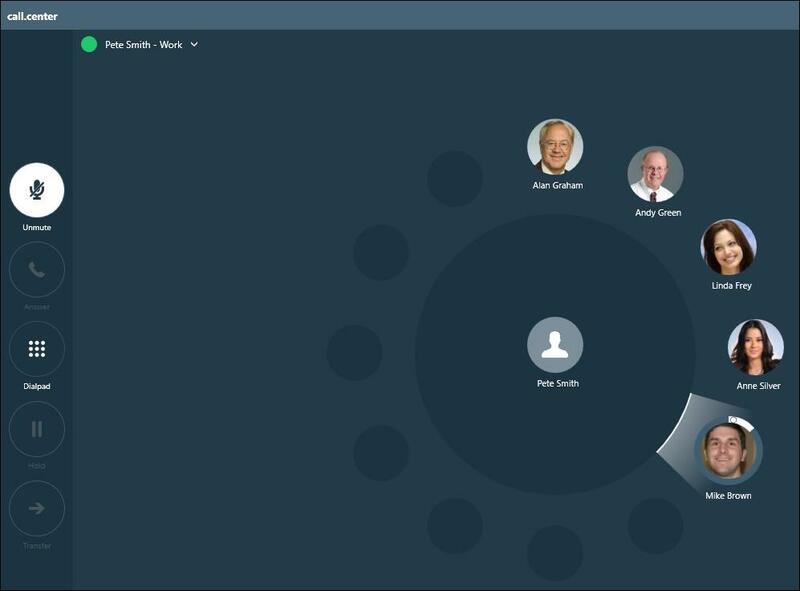 For example, Pete Smith and Mike Brown are in an active call and Pete Smith wishes to transfer the call to Alan Graham, that is, connect Mike Brown and Alan Graham, see image below. Pete Smith drags the Mike Brown icon from the Home Circle and drops it onto the Alan Graham icon. Depending on the operating system platform, a drop-down menu (with the Pin and hold, Pin and mute, and Transfer options) may be displayed. Select Transfer and a call transfer is initiated. Alan Graham's phone rings, if answered, the call is then successfully transferred. Once a call is active, participants may transfer the call to other phone numbers. Transfer a call by manually entering the phone number of the party to transfer the call using the Dial pad, and using the Call transfer button. This feature is not available for all operating system platforms. 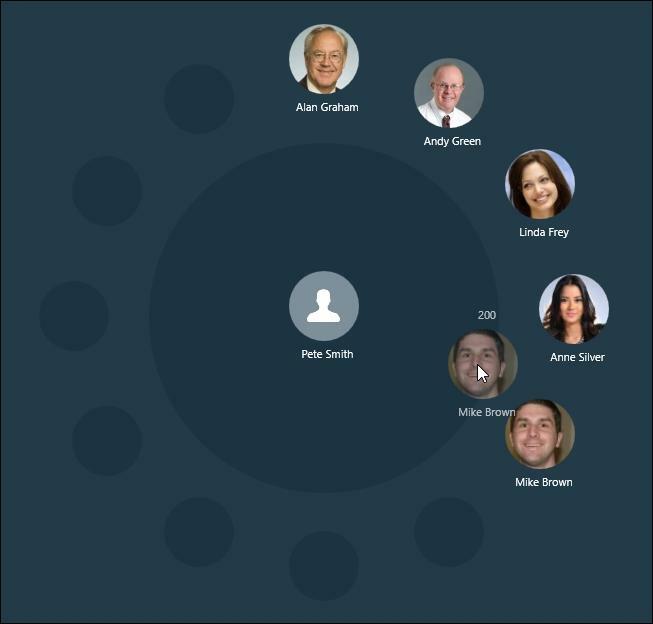 For example, Pete Smith and Mike Brown are in an active call. 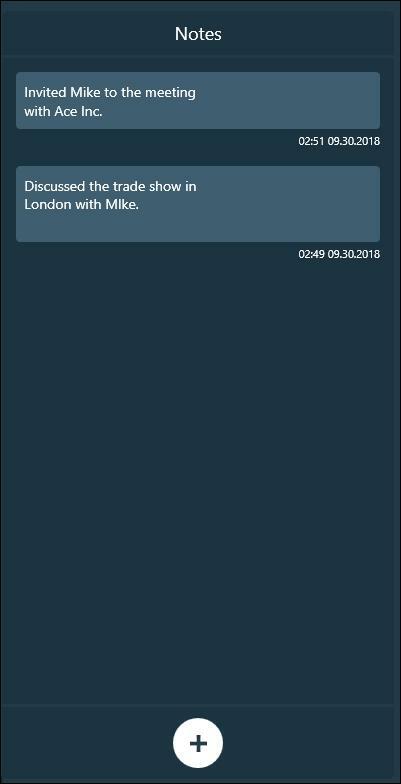 Pete Smith wishes to transfer the call to extension #500, that is, connect Mike Brown with the person at extension #500, see image below. To do this, click the Dialpad button in the Phone Function Menu to display the Dial screen. Enter the phone number and click the Transfer button to dial the number and to proceed with the call transfer. After clicking the Transfer button, the call is disconnected from the call transfer initiator even if the call setup does not succeed, for example, when the call is not answered. 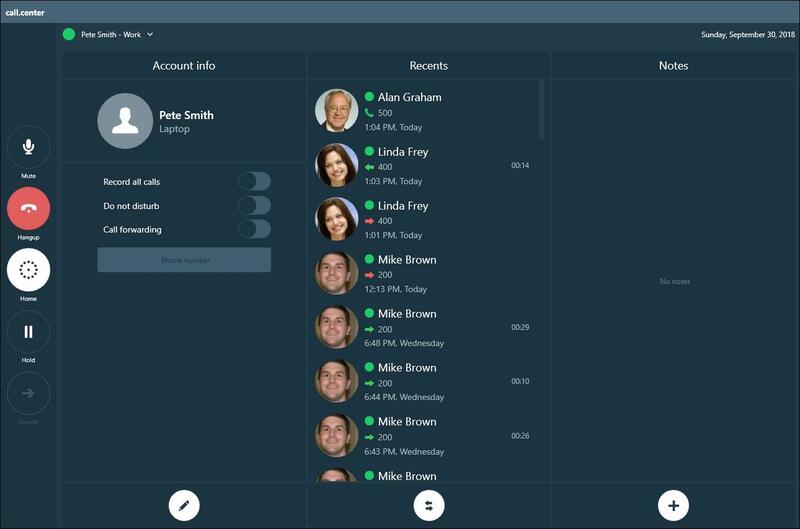 The call.center™ app integrates with native contact information already on your device where the app is installed. 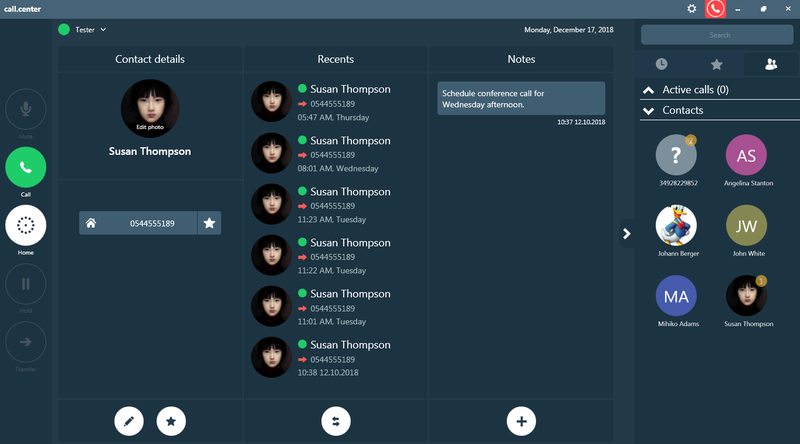 For some operating system platforms such as Windows, you may import contacts from a Microsoft or Google account or just simply create a contact database specifically for the call.center™ app. Click the Dialpad button in the Phone Function Menu to display the Dial screen. 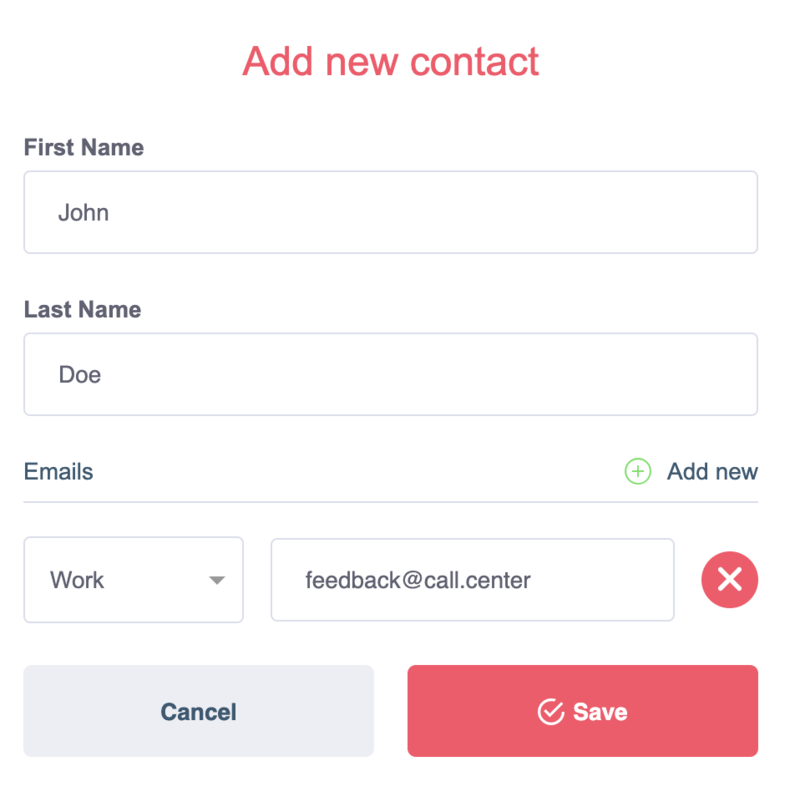 Click the button to display the Create Contact dialog box. 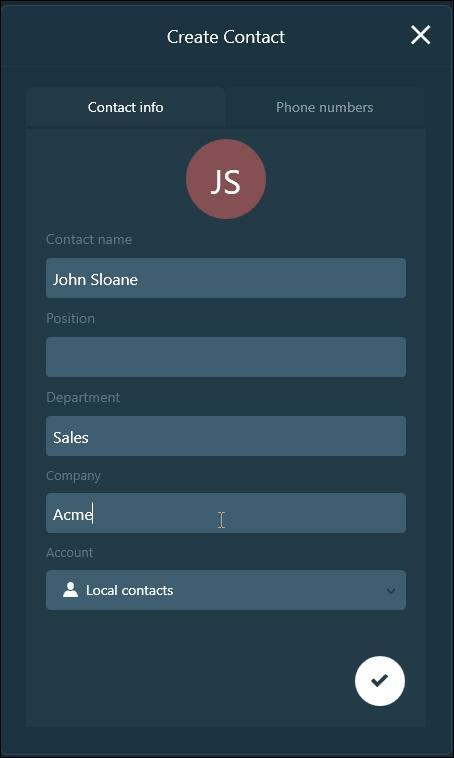 Enter a name in the Contact name field. Select the type of account from the Account drop-down list, i.e. Local contacts. Click the Phone numbers button on the top-right corner of the Create Contact dialog box; the Phone numbers window is displayed. Click anywhere on the Add phone number button to display a new field just above it where you can add a phone number. 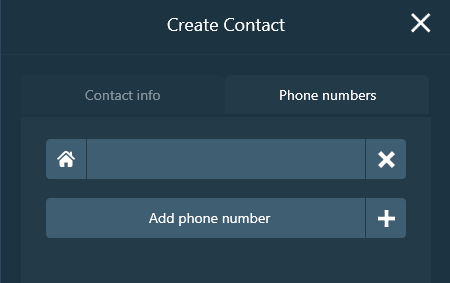 Enter the phone number and click the button to save it; the contact you created is now displayed in the Contacts area. 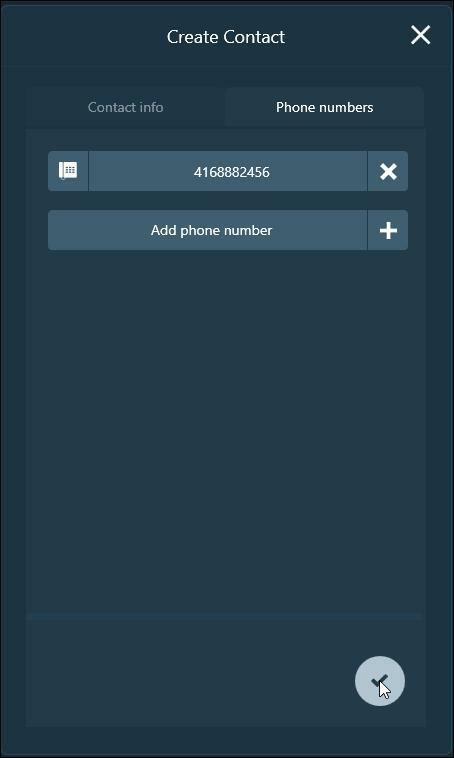 When you receive an incoming call, the call.center™ app attempts to match the caller’s number with an existing contact on your device. 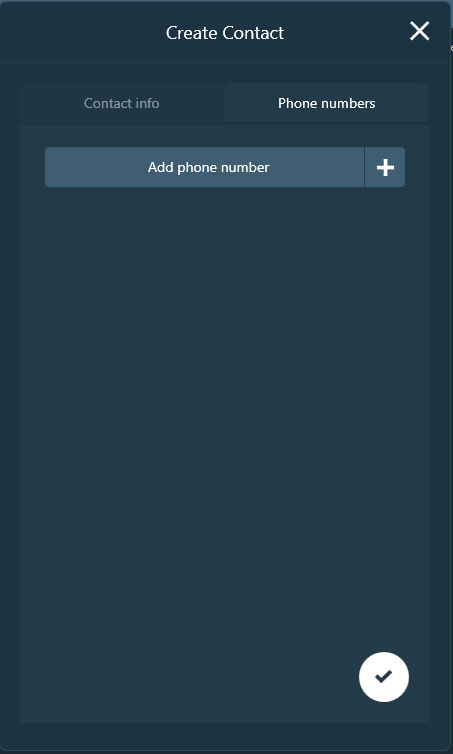 If the incoming call is from a phone number that does not match any existing contact in the database, then the icon and the caller’s number are displayed in the Favorite and Recents area instead. After the call, you may add the caller’s details into your device’s database. To add the caller, click the on your Home Screen to display the available information the call.center™ app has about the caller, i.e., the phone number and the time and date of the call. 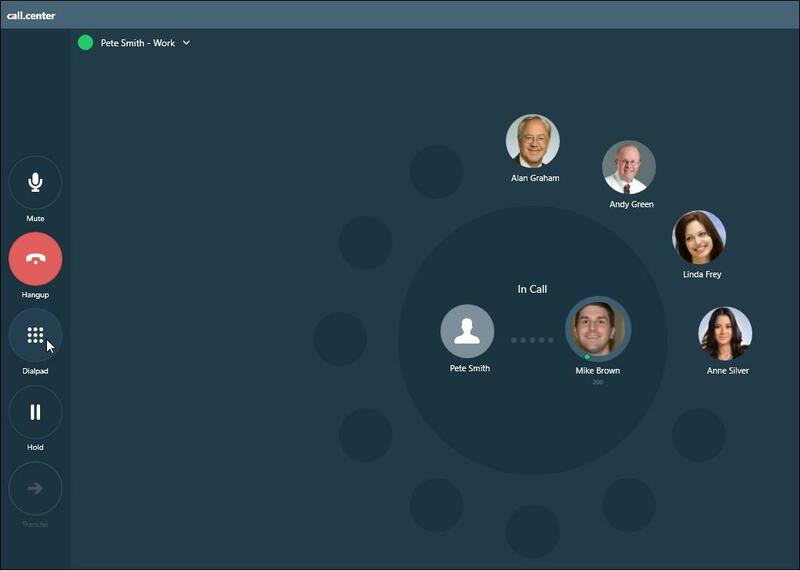 Click to display the Create Contact window, enter or change the relevant details and click to save. Click to save. Note that the forms and screens to manage contact information depend on your operating system. 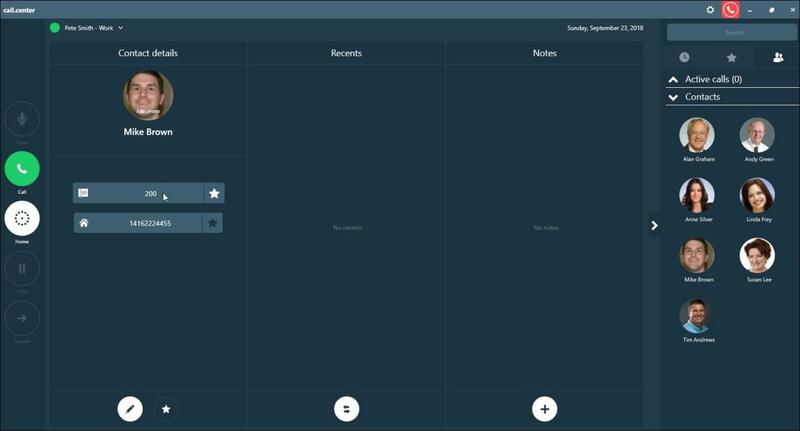 You can add, edit, archive, or delete notes for a contact. The number shown on the contact’s top right icon is a counter that indicates the number of notes for that contact. Click the icon of a contact to display its details. Each note includes a date and time stamp. To add a note, click to display the Edit note dialog box. 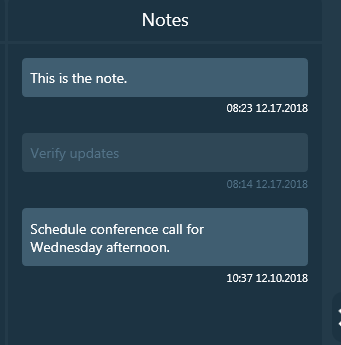 Enter your note and click to save the note; the note you wrote is displayed on the Notes pane in the contact’s details window. To edit a note, click the note to edit on the Notes pane to display the Edit note dialog box. Edit and click to save the changes. Click the Archive checkbox in the Edit note dialog box ( ) and click to save the changes. 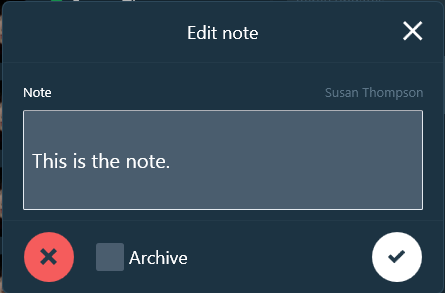 The note is grayed out on the Notes pane indicating it is archived. Click on the note to delete; the Edit note dialog box is displayed. Click to delete the note. 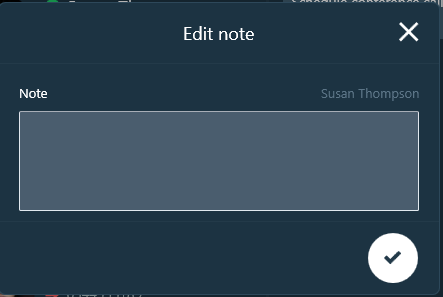 The note is removed from the Notes pane. The contact or number to or from which the call was placed or received. An arrow indicating if the call was inbound , outbound , successfully connected , or failed . Call records may be individually deleted from the Recents history. Deleting differ depending on the operating system platform. For Windows, right-click a call record to open a menu with an option to delete the record. For Mac OS and iOS, swipe the record to the left or right to delete the call record. 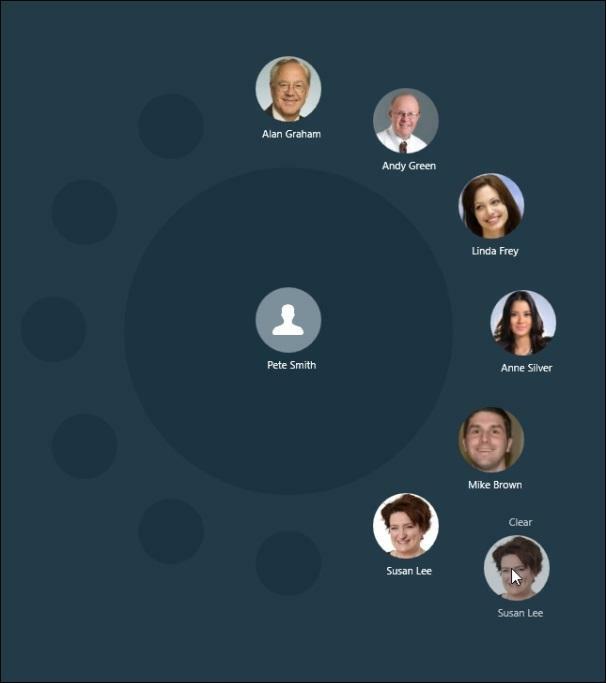 The Favorite and Recents area around the Home Circle is automatically populated with contacts who were recently called or from whom calls were received, or contacts that were designated as "favorites". The contacts in the Favorite and Recents area may be cleared individually or collectively from this area, depending on the operating system platform. In order to remove a single contact from the Favorite and Recents area, "drag" the selected contact icon from its location in the Favorite and Recents area and drop it towards the screen border. In the image below, the contact "Susan Lee" is dragged and removed from the Favorite and Recents area. 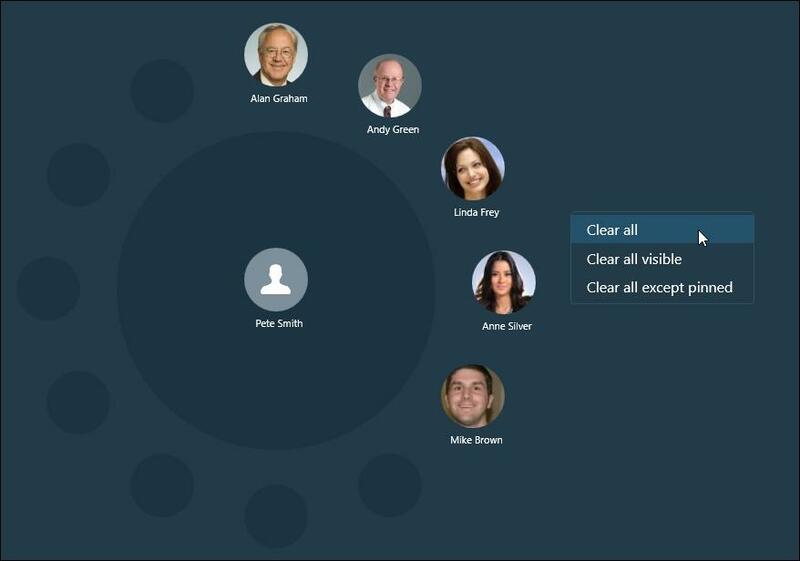 If collective clearing of the contact is supported by your operating system platform, right-click the area outside Favorite and Recents to display a menu, from which you may select the required "clearing" option. Select Clear all, Clear all visible or Clear all except pinned from the drop-down menu; the Home Screen is cleared. User Guide | Community Support | Feedback | News and Updates | Privacy Notice | Copyright 2019 telecom.center™ | All rights reserved.